​Salvete commilitones! Welcome to my website, a place where I can showcase my published books and let you know what I am currently at work on. My historical work centres mainly around Roman military history, but I also publish tabletop roleplaying games under the ZOZERGAMES imprint. Feel free to get in touch via Facebook or via my CONTACT page. I look forward to your thoughts and questions. Writing and history have always been intertwined since I was young. I grew up on Roman epics like The Fall of the Roman Empire and Ben Hur, and devoured books on ancient history. At school I gained an O-level in Classical Studies and an A-level in Ancient History. Although I actually wanted to be a geologist, I dropped out of my Geology BSc. degree in 1989 to instead pursue my great love, Ancient History and Archaeology (BA Hons.) at Cardiff University. I began writing almost immediately; Cassell published Warrior Cults three years after graduation, a book about ancient sects and societies that mixed violence with magic or religion, they also published my sequel, Brotherhoods of Fear, as well as Assassin! In amongst all that, an associated imprint, Arms & Armour Press. published my book on the dichotomies and complexities of the Vietnam War in Vietnam: Conflict and Controversy. ​Following the millennium I moved to the coast and made myself a leather sling, an ancient weapon that enabled me to launch pebbles out to sea, 100 metres distant. It was the beginning of a deep interest in recreating aspects of history, what is known as 'living history'. Within a few years I was constructing authentic Roman shields, clothing and belts, and delving deep into the everyday lives of Roman legionaries. I joined a couple of fantastic Roman re-enactment groups and met some very knowledgeable and thoroughly nice people. My writer's brain classified, catalogued and filed away every tid-bit of information I discovered, every clue and piece of research dug out of ancient texts, wall-paintings and gravestones. My overriding obsession was with the experiences of the everyday soldier, this was as close to time travel as you could imagine. On one occasion there was a call for volunteers. Who wanted to be charged and attacked by fully armoured cavalrymen? Unsure at first, I was still eager to find out what it was like to be charged and then attacked by someone armed and armoured on horseback. I joined the group to 'step back in time' and to try to recreate some experiences, to live a little like a Roman legionary. At this event I knew that I would volunteer at least once. It was great! It was exciting! It was scary! At least once a javelin hit my shield so hard it smacked it straight into my face. No blood though, unlike one of my poor friends. I got mine during an archery barrage, a 70 mph blunt arrow on the end of my big toe. Ouch. I dropped out, the line closed up - fantastic, all except the titters of laughter at my predicament! ​Hardships seemed to appeal to me. I knew life was pretty grim for a Roman soldier and I wanted to feel at least some of that grimness. I wanted to step into those shoes (or hobnailed boots). It was the driving reason that I participated in the grueling marches across country in full Roman marching kit that we organised. Isn't this what the legionary did? Mile after mile of marching, carry his camping equipment and weaponry with him - willpower, sweat and cursing? I've felt that pain, encountered the same difficulties. Was I a masochist? Not really. I was certainly not going to recreate digging a 10 m. long ditch. Bugger that - it was hard work! There was a limit to my re-enactment desires! 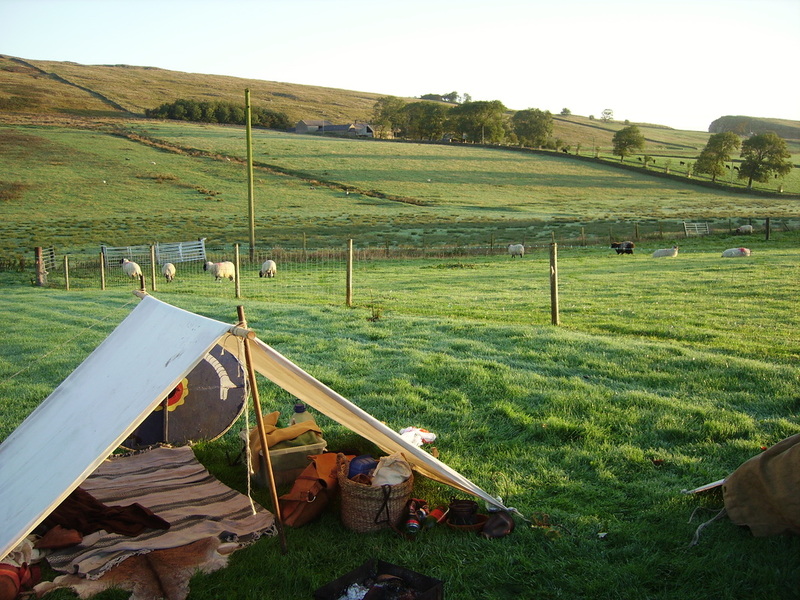 My simple Roman shelter, a canvas thrown over a simple spear acting as a ridge pole, went some way to exploring the hardships of life on campaign, it was bare and functional - and at 5:00 am it was freezing! But I felt the same pain a new recruit would feel and sat on sheep-grazing land a mile south of Hadrian's Wall; wishing I was tucked up in bed at home! ﻿My aspirations weren't grand or lofty. I didn't want to own fabulous armours or helmets, I didn't want promotion to the cavalry and get a ride to the battlefield, I didn't want a bigger tent and so on. I wanted to experience life for Mr Average. It's why my adopted name was Gaius, the most common of Latin praenomens. It's why I always chose the most common of items to reproduce or buy. I didn't want to be special or elite or cavalry or officer class. I was purely interested (obsessed with?) reproducing the material world of the everyday soldier - you know, the kind of guy who never gets a mention in those grand histories of Tactitus, Caesar and Ammianus ... John Doe, Smith, Mr Average, The Typical Soldier, the Legionary, the Grunt, Doughboy, Tommy. All the real stories are there in those millions of lives untold by the grand classical writers. Pick up a more modern war biography. Pick up 'Chickenhawk' or 'The Forgotten Soldier', pick up 'A Soldier of the Seventy-First'. All gripping war stories of men on the front line, doing what they were told to do with no freedom, writing down their grim experiences for later generations, ignored by historians. I wrote The Last Legionary in 2006 for History Press, documenting the life of one of the very last Roman soldiers to garrison Britain. That book is pure Late Roman docudrama, following the life of this soldier as he finally gets his orders to sail away from Britain. Several years later, publishing legend Alan Sutton and his new team at Fonthill Media, offered me a deal to write several books on Roman and Iron Age Britain that utilised the huge amount of living history research that I had compiled over the years. These books were Legions in Crisis, Everyday Life of a Soldier on Hadrian's Wall, Food and Farming in Prehistoric Britain and Warfare in New Kingdom Egypt. Yet one of the most cherished of my books made it to Kindle, not print, and that was Behind the Eagles. This novel charts the doomed expedition of emperor Julian into Iraq to fight the Persians, an expedition which Julian does not survive. Nor do more than half his men. The losses were catastrophic and Behind the Eagles uses detailed accounts from an officer on the expedition, Ammianus Marcellenus, to chart the tragedies, the horrors and travails of the men on that campaign. And one mystery is solved. Who did kill emperor Julian? For reports at the time suggested that a Roman javelin was pulled from the wound. Who knows how Julian died, for sure?